Lexington Reservoir has so much water it's spilling over. I haven't seen this happen in more than 20 years. Over more than 30 years of riding, I’ve refined the Santa Clara to Santa Cruz ride and back to the point where I think I have the shortest and safest route, but not the easiest. From Santa Clara I take San Tomas Expressway to Winchester, jog over to University Avenue and in downtown Los Gatos I pick up the Los Gatos Creek Trail. From there it’s a tough climb to Lexington Reservoir and then a ride around the lake on Alma Bridge Road. After climbing Old Santa Cruz Highway I take a left on Summit Road and then a right down San Jose-Soquel Road (Morell Cutoff is a nice diversion). I make my way to Cliff Beach Drive and take that over to the San Lorenzo River and the Boardwalk. It’s about 35 miles. The ride back takes me along the San Lorenzo River bike path and then on Plymouth Street. I take Emeline Street under Hwy 1 and pick up El Rancho Drive, which parallels Hwy 17 until Mt. Hermon Road. I ride on Scotts Valley Dr. to get to Glenwood Highway and take that up to Mtn. Charlie Road where the hard riding begins. At the summit it’s all downhilll on Mtn. Charlie Road and Old Santa Cruz Hwy. I stay on Old Santa Cruz Hwy and parallel Hwy 17, taking Hwy 17 for a short stretch to get to Alma Bridge Road. There is a path you can take on the right, but it’s rutted and muddy when wet. The distance is about 34 miles from my house in Santa Clara. I’ve tried all the other routes, including Hwy 9 (lots of traffic), Hwy 1 (a great way to go if you’re up for 100 miles or more), Bear Creek Road, Graham Hill Road, Zayante Road, etc. My most recent discovery was El Rancho Drive. It works both coming and going from Santa Cruz, and is by far the best way to go, with no traffic and a steady grade. Note that when going to Santa Cruz you take the 17 clover leaf on-ramp from Mt. Herman Road. Be sure to signal well ahead your intention to turn left onto El Rancho. There’s a stop sign where you can do this. Of course, watch for oncoming exiting traffic. They’re not exact, but close enough. When you look at these routes be sure to select the bike route option in Google Maps in “Get Directions,” or you won’t see route with the bike path portions. This entry was posted on April 3, 2011 at 11:16 pm and is filed under News. You can follow any responses to this entry through the RSS 2.0 feed. You can leave a response, or trackback from your own site. Looks like a good route, especially since my favorite return, Eureka Canyon/Highland Way, is blocked by a mudslide. 1) La Madrona (west side of CA17) is an alternate to El Rancho into Scotts Valley. Neither road has much traffic, but traffic noise may be irritating due to the proximity of CA17. Market St. -> Branciforte Rd. -> Glen Canyon Rd. takes you to the same place but with easier grades and less traffic noise, though traffic on that route is more frequent. 2) A less urban alternative to Scotts Valley Blvd. is to turn left on Bean Creek Rd. just past Mt. Hermon Rd. Bean Creek descends quickly into cool redwoods, although the climb out is steeper than the climb on SVB or Glenwood. Distance and climbing are slightly greater. 3) While it certainly doesn’t give one a feeling of safety, if it is desired to minimize time and distance, then one should stay on CA17 past Alma Bridge Rd. and descend with traffic through “the chute” into Los Gatos. Unless one is planning to stop in Los Gatos, it’s quicker to exit the highway at CA9. Overall, this is a good route to take to Santa Cruz and back when time and/or daylight are limited. La Madrona has considerably more traffic on a narrow, bumpy road. I found the drivers to be less than accommodating. Bean Creek Road is nice and I use it when heading to Felton, but it means riding on Mt. Hermon a ways. I’d just as soon head through Scotts Valley. There isn’t a lot of traffic on Scotts Valley Dr. and it’s wide. 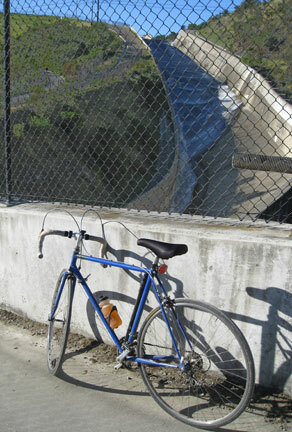 Come on Bill, riding down 17 from Lexington Reservoir is suicide, for a lot of reasons. Narrow lanes, concrete sidewalls, little room for maneuver, high speeds, bumpy road. And it’s a left lane exit to Los Gatos! Not recommended under any circumstance. Bean Creek Rd. runs between Scotts Valley Blvd. near Mt. Hermon Rd. and Glenwood Rd. not far from Mtn. Charlie Rd., cutting out most of the urban riding on Scotts Valley Blvd., and a good deal of Glenwood Rd., including the often hot, suburban riding (and frequent stopsigns) on Glenwood Rd. past Scotts Valley High School. The worst part is the left turn onto Bean Creek from Scotts Valley Blvd. just uphill from the Shell station. The best way to take CA17 through the chute is to move squarely into the right-hand lane as your speed begins to match that of highway traffic, roughly halfway down the hill from Lenihan Dam. I suspect cyclists who try going this way only once hug the disappearing shoulder as their speed demands more maneuvering room. The road is smooth, but wind turbulence makes the ride rough. This is one place you don’t want motor traffic passing you in close proximity. Then move to the shoulder when it reappears 1/4-mile later. Unless you get a lucky break in traffic _and_ you plan to stop in downtown Los Gatos, it’s quicker to continue on CA17 to the CA9 exit. This is _not_ the left-hand Santa Cruz Ave. exit just past The Cats, but the next exit a mile further downhill. You’ll be flying at this point, so it won’t take long to get there. A Caltrans sign even directs bicyclists to exit. It’s not a relaxing way to go, but it is quick. I prefer it to the Creek Trail when going downhill. You take the lane when your speed begins to match that of highway traffic? When would that be, Bill? The highway traffic is going 65 mph and there’s usually plenty of it. The little section on Highway 17 that Ray talks about is OK, though, because the cyclist is never actually on Highway 17, but always on the shoulder of the on/off ramp. In the other direction, I take the dirt side path rather than ride all the way around every little cove of the reservoir. But the dirt path is dreadful in the mud; your wheels stop turning as your brake bridge cakes with mud. Highway motor traffic has always slowed slightly to let me into the lane on the downhill section before the narrows. Being assertive (but not rude) and riding a funny bike helps, especially on the weekend when folks are in a good mood after returning from the beach. Usually my speed is in the high-40’s here, but it can be higher if there’s a tailwind. I know most traffic likes to go 65 here, but the speed limit is 50, 35 for semi’s, and for good reason. I’m not a lone crackpot. I knew someone who commuted every day this way by bike, and I have seen other cyclists doing the same, and not at my advice. On northbound CA17 between Bear Creek Rd. and Alma Bridge Rd. there is no paved shoulder for much of the distance. At one point you must ride in the lane to avoid riding over a storm grate. The Los Gatos Creek corridor is the lowest crossing of the mountains between CA92 and CA152 and by far the easiest way to get from the south bay to Santa Cruz (and back). It ought to be easier to bike this corridor. The Los Gatos Creek corridor is the lowest crossing of the mountains between CA84 and CA152 and by far the easiest way to get from the south bay to Santa Cruz (and back). It ought to be easier to bike this corridor. Fred Markham used to ride the entire length of 17 that was legal, back in the day. That was when he worked at a car dealership in the Valley. Ironic. The short stretch of 17 I ride does indeed have a drainage grate, but you could just as easily go right of the grate. It’s not a big deal to go left because that’s the merge lane for Bear Creek Rd. at this point. The short stretch of Highway 17 that Ray and I both ride is a merge lane, first for the Bear Creek on-ramp and then for Alma Bridge Road, the whole distance. The cyclist never actually gets on Highway 17. Fixed it for you. Might I mention that most cyclists can’t ride 45+ mph? Ray, I’m surprised you didn’t rank Devil’s Slide higher. Once on a tour I ended up riding it at rush hour. No shoulder, blind curves, constant 50 mph traffic. I thought I was going to die. It was way worse than Market Street or Highway 92. Shouldn’t be too hard for a fit cyclist to get to 40 mph, 45mph at sprint effort, on the short section without a shoulder. Don’t forget that is at the bottom of the downgrade from the dam, so gravity gives a big push. I guess I’m not fit then. But judging by all the riders I passed this weekend on the Cinderella, many many riders are less fit than I am.